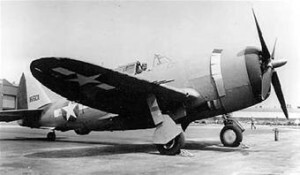 On the morning of April 15, 1943, 2nd Lt. James F. Lyons took off from Bedford Air Field in Bedford, Massachusetts, in a U.S. Army P-47C aircraft, (Ser. No. 41-6459). Lt. Lyons was assigned to the 342nd Fighter Squadron. Shortly after 9:00 a.m., he was killed when his airplane crashed and exploded on the Tibbet’s Farm located on West Main Street in Northborough. The crash was witnessed by a man and wife living across the street from the Tibbet’s Farm. Their attention had been drawn skyward by the sound of a motor “screaming” overhead. “It came out of the sky at a terrific speed,” the man later told a reporter, adding, “The thud and the explosion were awful. It was all over in a few seconds.” The couple ran to the site of the crash, but were driven back by exploding bullets. The aircraft reportedly left a crater twenty feet across and ten feet deep, with stones and debris thrown up to 300 feet away. Lt. Lyons was reported to be from Newport, Rhode Island. The following two articles are from an unknown newspaper. They were obtained from a scrapbook in the local history collection at the Shrewsbury Public Library, Shrewsbury, Massachusetts. Shrewsbury borders Northborough. “Pilot Believed Killed In Fire Or Explosion”, April 16, 1943.